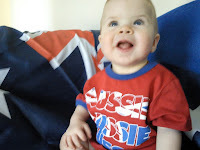 It's Tricky's first Australia Day so in true bogan style his Perth Nanna gave him a "Aussie Aussie Aussie" tshirt. Perth Nanna (my mum) is slightly Aussie-obsessed. She has the stickers, the flags on the car, you name it. I have inherited this Aussie-obsessive gene. My claim to fame is that I could sing, by heart, the national anthem from age 3 - it's on tape. I'm your go-to gal if you ever need help with the lyrics. I even know the second verse. See I don't care if you were born here or if you don't "look" Australian (I have no effing clue how can you look Australian anyway?). If you call Australia your home then that's all I need. In celebrating tomorrow I recognize what we have become as a nation... even though we might not have had the best of starts. I celebrate that we have universal health care - it meant Tricky could have his operation without it costing us thousands of dollars and remortgaging the house. I celebrate that we have democratic elections, even if it takes a week for the results to be known. I celebrate that even though 49% of the population are unhappy with those elections there is not mass rioting and looting, just grumbles at the dinner table. I celebrate a nation that pulls together and takes care of those less fortunate by raising millions of dollars for the flood victims. I celebrate a nation that realizes the importance of mothers and has paid maternity leave. So tomorrow when I'm having a picnic lunch in a national park with a dozen of my friends and the three dozen Anzac bikkies I made today (that's a good ratio, right? ), I'll be celebrating the Australia that Tricky will grow up in. Wow. I just read your post about Tricky's operation and the one before it about aunty Helen. They had me in tears. What a beautiful story, and told so well.